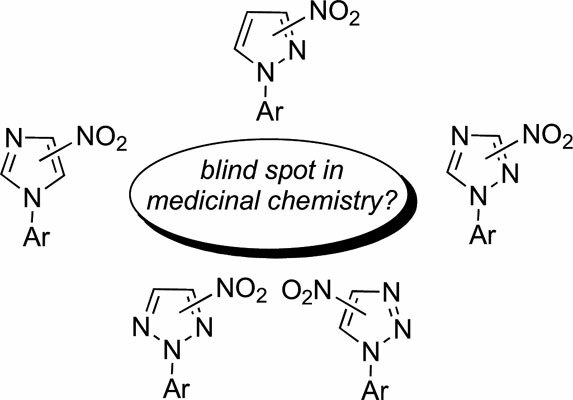 The review provides a summary of synthetic approaches to and medicinal applications of N-aryl-C-nitroazoles. This broad chemical family delivered numerous practical applications in the areas other than pharmaceuticals. This is most likely due to a common stigma associated with nitroheterocycles implying their inherent toxicity. Therefore, the research literature appears to be lacking in medicinal chemistry reports related to this class of compounds. However, despite this notion, the nitroheterocycles have enjoyed a marked renaissance in the last years, particularly, in antimicrobial area. Therefore, an attempt to summarize, within a single review article, the medicinal applications and methods of synthesis has been undertaken. ANRORC, aromatic nucleophilic substitution, metal-catalyzed, N-arylation, nitroazoles.